The old stone house on Wickham Blvd. has been known for years as the Lakestones House. The land deeds lists Frederick Wickham, Harriet, his wife and Elizabeth C. Lewis and Sarah Wickham as conveying the land to Augusta B. Parsons (wife of Colonel Enos Bloss Parsons) of Rochester on July 5, 1883. Colonel E.B. Parsons built Lakestones House for his wife. He was the owner of the Malt House at the Point. According to Arch Merrill (in his book “The Ridge” 1944) it was “a Baronial Castle with wings, turrets huge fireplaces, a conservatory, stable and a log cabin on the beach”. Legend has it that while the house was being built Mrs. Parsons would come out from Rochester to supervise. If she found stones placed not to her liking , she would have whole areas torn out and replaced. Unfortunately, this house has experienced damage due to several fires over the years. On a bleak January night in 1890 there was a fire, which started in Col. Parsons’ bedroom, which they figured was the result of a fire in the fireplace earlier. The parsons having left for New York City. This fire did about $4000.00 worth of damage. In 1923, the Estate was sold to G.R. Mills of Sodus. Mrs. Parsons having died. In 1934 there was another fire. This one was much worse and the slate roof over the main part of the house collapsed and the mansion was a gutted ruin. 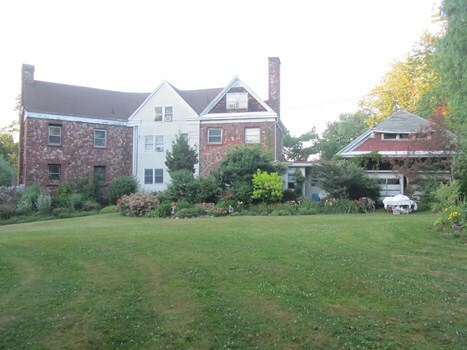 In 1968 the property was again sold to Clayton and Barbara Powell. A few years later, fire once more did extensive damage to the property. The center section has been rebuilt. Col. E. B. Parsons owned the malt house. Was gathered from the lakeshore. With huge fireplaces, and other things. Til fires burned my Lakestone walls. A blow torch started my terrible plight. Water in the pipes had ceased its flowing. A blow torch was used to get it going. And turned it into ashes on the land. The Lakestones House is located on 8411 Wickham Blvd.